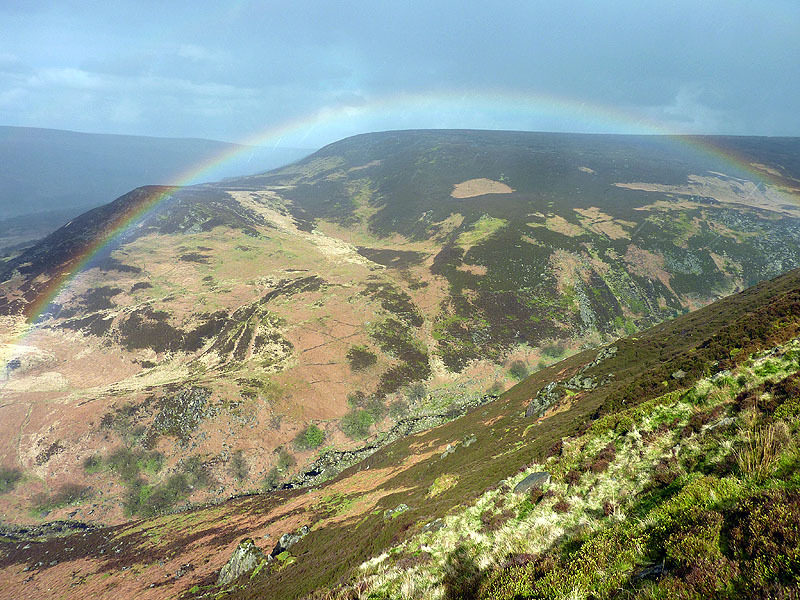 No pussyfooting about, the Pennine Way gets immediately in its stride with a crossing of the Dark Peak north of Edale. Going northwards, the Dark Peak is England’s first true hard country since Dartmoor far to the south-west, a vast tract of unimproved land (albeit managed as grouse moor) where the unwary traveller can easily lose sense of time and direction. 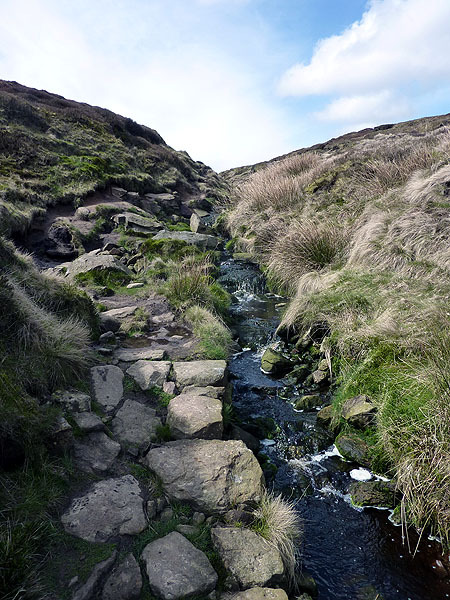 The boundary between Dark and White Peak is marked by the Hope and Noe valleys, in the latter of which Edale lies – the Manchester-Sheffield rail line passes through to give superb access. White Peak: limestone-based, softer, drains well, around 1500ft. 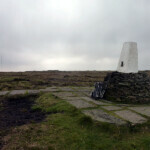 Dark Peak: gritstone-based, rougher, clags into peat morass, around 2000ft. 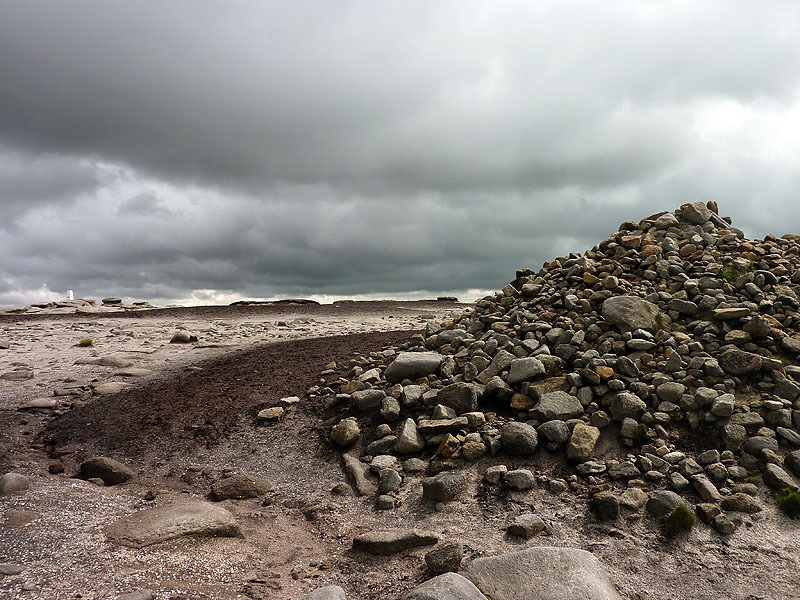 The Pennine Way sees no limestone for many miles, well into the Dales. But there has been some chickening out since my early days – in this case, the sweltering (even by early-21st century standards) summer of 1976. 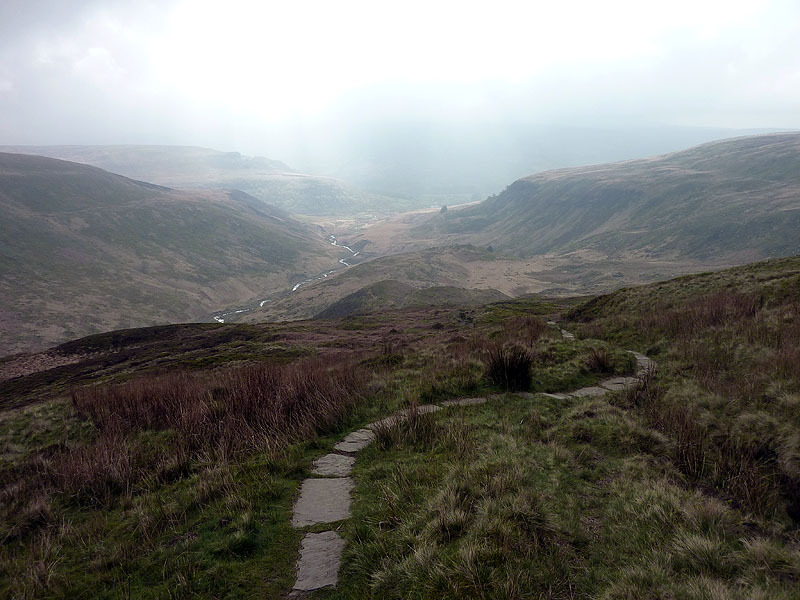 The original route set off uncompromisingly, up Grindsbrook Clough, and straight over the Kinder plateau to Kinder Downfall. A wimpier alternative by Jacob’s Ladder was given as a bad weather alternative, but ignored by most. Now, though still a right of way, the plateau route has been stripped of its PW status, no doubt to relieve erosion. 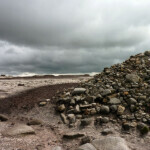 The plateau, beset by coarse heather and deep peat hags, is no place for the inexperienced walker, and there are plenty of those on day one of the Pennine Way. Mentioned only to name-check the Jolly Rambler Inn, still there though without the Jolly, and to note that on this trip I made no advance bookings whatsoever – something I would never contemplate now, partly because age demands comfort and certainty, and partly because of Llanidloes, which experience will one day be written up on my Glyndwr’s Way pages. Jolly Rambler cost £4.50 for B&B, and I hoped never to pay so much again. In 1976 I took the plateau route, natch. I knew the area well, having been walking there regularly for three years, usually helping to lead parties from the school where I taught. The afore-mentioned hot weather had dried out the peat, making the bog-trotter’s paradise into a simple long walk, if you knew where you were headed. After Kinder Downfall, the route tracks over to the Snake Pass, the highest point of the A57 road, and then to the Dark Peak’s second 2000-footer, Bleaklow, before dropping down to the Crowden valley. 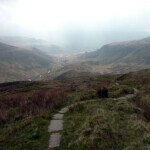 The descent above Torside Clough was the first new ground I had broken. The 2014 walk is described in detail on my cross-England pages. In 1976 my overnight accommodation, Crowden hostel, was run by the Peak Park Planning Board; these days, such state enterprise is discouraged. The hostel was decanted to the tender care of the YHA, who peremptorily dumped it in about 2012. I paid £2.40 in 1976; in 2014, £4.50 to pitch my tent at Crowden campsite, so inflation is not too serious if you don’t mind losing a few creature comforts. 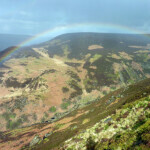 If Kinder and Bleaklow have a bad reputation for clag, that of the Black Hill – the first climb of this day – was once even worse. Remember, this was well before helicopter parties dropped and set flagstones; generations of walkers had spread out, making the clag-width wider and wider. I read recently that the flagging has enabled the top to regain something of its old ecology – proof that an apparently un-natural intrusion can work to the good, even if it makes the walking less challenging. 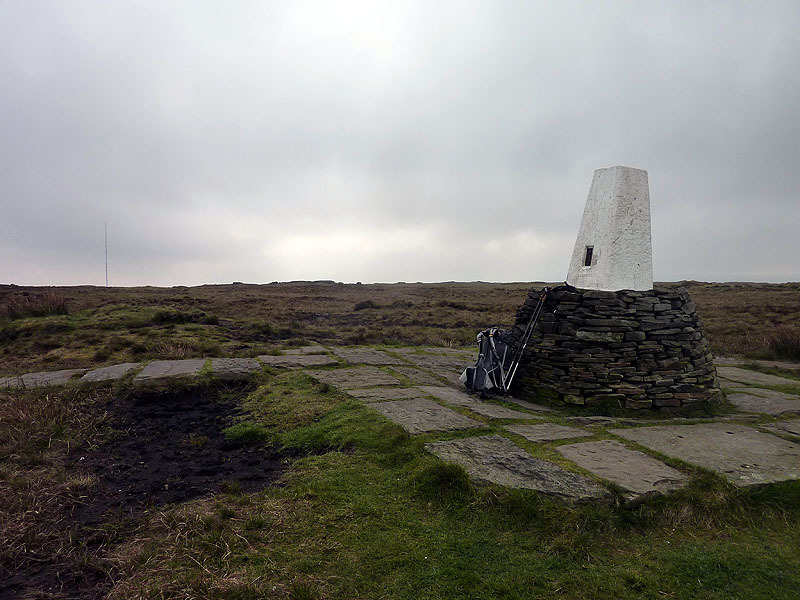 From Black Hill, my 1976 PW took an uncompromising line to the A62 summit at Standedge, with a ‘bad weather alternative’ down by Wessenden reservoir; here, as on Kinder, the easier route has become the official. 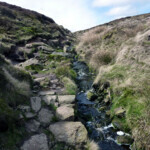 Now, the official route itself has a diversion, should Dean Clough be in spate. (In 2014, I split off just after, to head towards Meltham and my sister’s house.) From the A62, the PW crosses a succession of trans-Pennine roads, with one very big one – the M62 – having appeared on the scene since I was there. My 1976 day ended at the White House pub, high on the A58, which I was sure would have rooms, but then as now it did not. It did however have a bus service, and a friendly landlord who must have been used to this, recommending the (now closed) New Inn at Ripponden. £2.50 B&B. The New Inn gave me a lift back. Of the few miles that remain in my Dark Peak section, there are reservoirs to be walked beside, and a fine edge above the Calder, leading to the magnificent monument of Stoodley Pike before descent to the river – the first ‘lowland’ since Crowden.